Just when you thought it was safe to have a quiet drink in your hotel room… someone posts this on the internet!Gulp…. or maybe not! Given the number of times I’ve used glasses in hotels you can figure, if you’ve just watched this video all the way through, just how ill I feel right now! Can someone in the NI hotel trade tell me this is an uncommon practice… please..please? 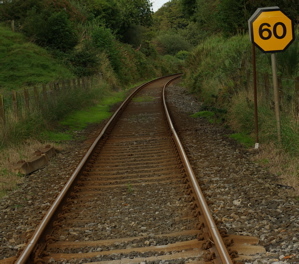 Derry to Coleraine Railway Link Unsafe? “There is only one reason these limits are there and that is for safety. There are speed restrictions as low as 10 miles per hour; there are restrictions of 20, 30 and 40 mph right along the track. If a train – and these new trains have a cruising speed of 70 mph – travelled any faster, it could be very dangerous indeed. Apparently £60 million will need to be spent to bring the link up to scratch.